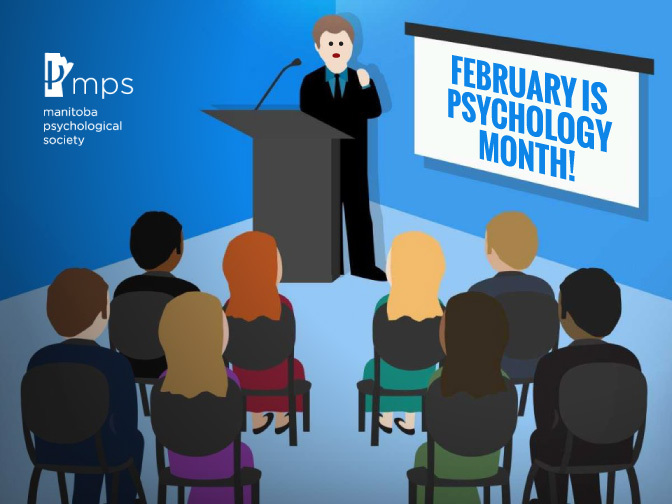 February is Psychology Month in Canada! Psychology Month is an initiative sponsored by the Canadian Psychological Association that began in 2005. The goal is to raise Canadians’ awareness of the role that psychology plays in their lives and in their communities. To celebrate Psychology Month, the Manitoba Psychological Society has organized a variety of educational seminars for the public on a wide variety of psychology-related topics. Please click button below for posters and schedule. CPA has issued a press release expressing disappointment that Canada’s health and financial ministers did not reach an agreement on federal health care spending on mental health and homecare. The Canadian Psychological Association (CPA) has partnered with a number of health organizations to denounce the government’s proposed plan to tax the premiums of supplemental health benefits. The website http://donttaxmyhealthbenefits.ca/ has been developed to inform Canadians about this issue and to allow them to send letters to their MPs. Please access a letter sent to the Minister of Finance, Mr. William Morneau by CPA’s Chief Executive Officer, Dr. Karen Cohen regarding this issue here. Graduate students in the Clinical Psychology Program at the University of Manitoba have expressed interest in accessing psychological services in the community. MPS is sending this notice to inquire about private practice psychologists who would be willing to see clinical psychology graduate students at sliding scale or pro-bono rates. This information will be sent to the Clinical Student Representatives, who will keep a list of the psychologists’ names and contact information. Upon each new academic year, the Clinical Student Representatives will email this list to the clinical psychology student body, who would then be individually responsible for arranging appointments. If you are interested in participating in this endeavor, please email your name and preferred contact information to Maia Kredentser, MPS Student Representative, at umkreden@myumanitoba.ca. The MPS 50th Anniversary Gala will be held on the evening of February 24, 2017 at Mercedes Benz Winnipeg. Please save the date and join us for a night of fun, food, and live music. Details regarding the event and ticket purchasing will be emailed to membership shortly. The MPS Annual General Meeting (AGM) will be held on March 20, 2016 at Inn at the Forks. The AGM will be an after-work event, with dinner, a business meeting and a speaker. Meetings of Psychology associations and presentations about topics relevant to psychology can be used toward continuing education credits. More information to come. The article for this month is titled “Why Psychology? An Investigation of the Training in Psychological Literacy in Nursing, Medicine, Social Work, Counselling Psychology, and Clinical Psychology” by D. Murdoch, A. Gregory and J. Eggleton from Mount Royal University. You can view it here. What is the focus of your research program? What are some of the clinical or theoretical applications of your work? Re #1, My students and I are examining the clinical utility of two constructs that have roots in social psychology and offer different ways of mitigating threat, namely self-compassion and self-affirmation. Self-compassion involves learning to respond to negative experiences in life that might ordinarily invoke self-criticism and shame with self-kindness, normalizing, and mindfulness. The research in my lab has shown that writing about painful events self-compassionately can reduce symptoms of depression and shame proneness (Johnson & O’Brien, 2013). Because self-criticism and shame are trans-diagnostic vulnerabilities I believe this work has broad relevance to many clients seen by clinical psychologists. Self-affirmation, in contrast, does not address threatening experiences directly, but rather invites people to consider their most important values and how they behave in ways that fulfill those values. Doing so seems to remind people that they are connected to others in important ways. Research suggests self-affirmation is especially helpful for protecting marginalized persons from becoming socially isolated through dropout and avoidance of engaging with others. Research in my lab is currently examining whether and how self-affirmation may benefit persons who are prone to social anxiety, narcissism, or are obsessively passionate about academic studies. Early findings suggest self-affirmation may help people with social anxiety act on recommendations to be more socially active and involved and may reduce feelings of envy in narcissistic persons. Re #2. This research examines how novice supervisors learn the craft of supervision and become fully competent. This research informs, and is informed by, my own practice of supervision as well as my teaching clinical supervision and a guide book I am writing on supervision. It is important to say is that I am deeply grateful to my students and collaborators for their enormous contributions to this research. Would you like to have a toolbox of interventions to give to couples that they love to use? With these proven strategies, help couples in your practice manage conflict and deepen intimacy! who are Gottman Certified Master Trainers with a wealth of experience working with the Gottman couples method. They are 2 of only 22 therapists in the world trained to teach Levels 1, 2, & 3 Gottman Workshops. They are also Senior Consultants, mentoring therapists in the certification process.